The translucent white panels, called milk glass convey a soft and diffuse glow while masking what's stored behind. The superlative solution for generous spaces. The banks of drawers offer precious additional storage. The Colonial Living Classic range of timber bathroom vanities incorporates design elements from our Colonial vanities range but with a contemporary appearance. 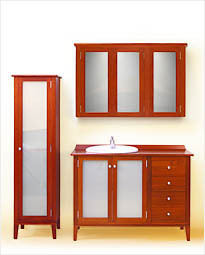 The Classic vanities range design origin can be traced to an over simplistic version of a variation on the William and Mary style of furniture; the popular royal couple William III and Mary II came to the English throne in 1689 and their tastes had a huge effect on decorative arts like furniture making. However, the dominant and underlining feature in our Classic bathroom vanities range are the opalescent, translucent white panels. They are bright enough with high light transmission, and at the same time, diffused enough to mask what's stored behind. To keep your choices open, we also offer an alternative comprising all timber doors. 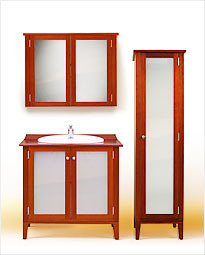 The prime requirements of a bathroom are functionality, efficiency and safety. Colonial Living's timber bathroom vanities are custom made in over 20 different combinations and styles contributing to a stylish and warm bathroom environment. 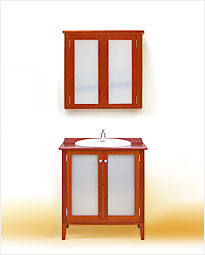 Manufactured in styles ranging from Colonial, Victorian to Classical Contemporary vanities.